It can be uncomfortable, especially if their foot hits your rib cage for example. You can even get internal bruises if baby kicks the same spot again and again. If baby does that you could try and ‘move’ your baby and turn them in a different direction. It sounds a bit odd, but it’s possible. But do be very careful! If you think about it, it’s logical the kicks hit hard, your baby is already (on average) 14.02 inches and weighs 1.68 pounds. Baby’s skin, that was reasonably transparent until now, is turning pink. Baby is getting ready for birth and will give special attention to the airways in the coming week. 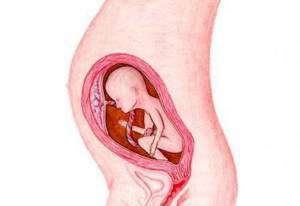 Your womb ‘hangs’ on the round ligaments in your abdomen and it is getting increasingly heavier. Not only because of your baby, but also because of the amniotic fluid, the placenta and the thickness of the womb itself. The round ligaments, that before fertilization only had to carry an ounce, now have a heavy weight to bear. It is high-level sport for your round ligaments. Don’t worry they can handle it. You may however sometimes notice that they are sensitive or even painful, then you have ligament pain. Make sure you get plenty of rest and pay particular attention to your posture. Be careful when lifting. So, don’t bend forwards quickly to lift something, but bend through your knees and then lift. This can be quite a challenge with a large belly but you will manage with a bit of practice. Do not lift heavy objects at all; ask someone else to help. Pregnancy Week 2: The egg is fertilized! Pregnancy Week 6: Your baby’s heart is beating! Pregnancy Week 20: Can you feel your baby? Pregnancy Week 23: Your baby is as long as a ruler! Pregnancy Week 33: Are you nesting? Pregnancy Week 35: Has your baby's head engaged? Pregnancy Week 36: Discharge or amniotic fluid? Pregnancy Week 37-41: Your baby can be born…!